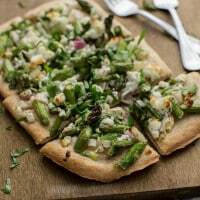 Spring Asparagus Flatbread | Naturally.Spring Asparagus Flatbread | Naturally. Minced flat-leaf parsley, for serving 1. Preheat oven to 450 degrees. Cut asparagus into 1/2-inch pieces. In a bowl, combine the asparagus with the onion, olive oil, lemon juice, zest, salt and pepper. Crumble in the goat cheese and toss to combine. Roll out the pizza dough into an 8-by-12-inch rectangle. Transfer to an oiled or parchment-lined baking sheet.